Spring has sprung at Four Seasons Hotel Hampshire and whether you’re visiting for an overnight stay, relaxing spa day or delicious meal at the hotel restaurant Wild Carrot, there is plenty to keep the whole family entertained this season. For younger (and those just young at heart) guests, the Hotel's new Sharkie’s Reef, a fun packed family adventure pool, features designs by Disney and Warner Brothers sculptor Justin Pook. Justin's impressive portfolio includes work on sets for blockbuster hits such as Christopher Robin, Beauty and the Beast and Puss in Boots. Justin's creative sculptures have helped transform the pool into a water wonderland with a four metre slide, a rotating umbrella fountain and bubble jets. These new family offerings add to the Hotel’s already impressive range of recreational activities; active children can be kept busy with a rolling itinerary of tennis lessons, horses riding across the Hotel’s 500 acres of stunning parkland, the Highwire Adventure – the ultimate tree-top challenge - and cycling. Meanwhile, those of a more relaxed disposition can be occupied with some classic British pastimes including croquet, falconry, fishing and clay pigeon shooting. Carra Baker the Equestrian Manager, Jon Bond the Angling Instructor, and Simon Wilson the Falconer all delight in disclosing stories to guests about their horses, their fish and their birds, all of which are found on and around the Estate. For smaller tots, the Kids for All Seasons club is open throughout the school holidays, offering crafts, games and a variety of fun events, while teens can enjoy the Games Room, featuring a range of table games such as football and air hockey, as well as video 28 games and films. in the fields of Dogmersfield Park, nestled within 500 acres of stunning countryside. 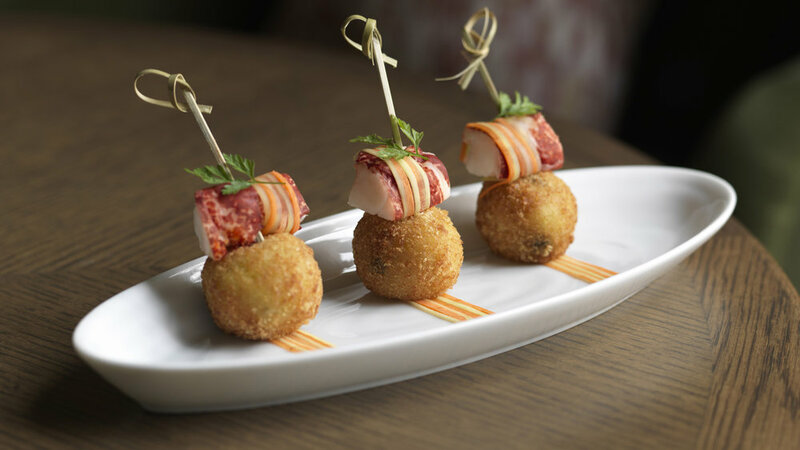 Wild Carrot Restaurant and Bar welcomes you to try delicious British classics with a contemporary twist, made only with the finest seasonal produce found in Hampshire markets and further afield. Each week Wild Carrot is also proud to host a range of events for every taste, including Friday Night Live Music from 6.30pm. Enjoy soothing live jazz every Friday evening at The Bar and welcome the weekend in style. Savour delicious cocktails and enjoy a selection of bites and snacks while listening to some favourite local musicians. Roll out of bed and go and try the Brunch menu, served every Saturday between 11:00 am and 4:00 pm. Choose from a selection of traditional plates, such as Eggs Benedict, Bircher Muesli or Clotted Cream French Toast, or dishes with a difference; such as the Cornish Crab Omelette, Spinach Pancakes or the decadent Oreo Waffle, and enjoy with one of the Saturday Cocktails, exclusively created to go alongside the Brunch dishes. new children’s adventure pool at Four Seasons Hotel Hampshire? T&C"s Email: info@countrychild.co.uk and SUBSCRIBE TO OUR MAILING HERE: Deadline: 15th April 2019. Prize available Monday - Thursday, meal includes three courses with a bottle of wine chosen by the sommelier. Valid until 31st August 2019.